Daypacks are hunting backpacks that are meant to sustain you for a whole day’s hunting trip. They’re built with minimal features. They hardly ever bear a weapon carrying system and if they do, it’s perhaps just to carry one kind of weapon. Indeed, the daypacks are usually held back when it comes to versatility. Well, that’s until now. ALPS OutdoorZ has made a breakthrough. For those who have been disappointed over and over again by the daypacks in the market, it’s time to check out The Matrix hunting pack. It goes beyond the boundaries that daypacks tend to limit themselves to. At first glance, it’s just a simple, compact pack. It’s a modest pack that doesn’t do much to shout about its spectacular feature. So, in this ALPS OutdoorZ Matrix Hunting Pack Review, we’ll reveal why this is an excellent hunting pack for any hunter. Yes, it does have a compact appearance. It looks modest and can easily be written off as another inadequate pack. However, don’t let its outside look fool you. The ALPS OutdoorZ Matrix Hunting Pack is packed with an array of pockets and compartments that secure your gear, easily accommodating all you need. It has an ample sized main pocket that’s accessed via the top. At the front, there are two wing pockets and two side mesh pockets. The pack’s waist belt also has two pockets. Still, if that’s not enough, you also get extension lashing straps that enable you to fasten extra loads onto the outside of the pack. All these pockets have been cleverly fit in dimensions of 20.8 inches by 13.5 inches by 6.8 inches, giving a total carrying capacity of 2700 cubic inches. Notice that this capacity is higher than for your average hunting daypack. The backpack must provide utmost comfort to ensure that you can carry as much as you need. This allows you to go further and carry more thus improving your chances of having a successful hunting trip. And the ALPS OutdoorZ Matrix Hunting Pack has been built with all this in mind. It’s proven to us that it can bear a large weight. It’s proven to us that its compact size is simply a matter of aesthetics. Now, we need to know that it doesn’t transfer the strain of the load onto our shoulders and backs. ALPS Outdoor Z included in the Matrix a center aluminum stay. Now, you might be wondering what an aluminum stay does. Well, the stay allows the load to spread evenly inside the pack, supporting you while carrying. With a stay, most of the weight is kept from collecting on your shoulders and is then transferred to your waist and hips. This makes it more easy for you to carry the pack. On top of that, this hunting pack has been made with a padded back and waist belt that provide added comfort while carrying. The mark of a hunter is the weapon carried. It would, therefore, be counterproductive to have a hunting pack that doesn’t provide a way for you to haul your weapon. You must need to keep your hands free while hiking. To ensure this, the Matrix comes with an elaborate weapon carrying system. First, the design of the pack allows you to fit a crossbow, compound bow or rifle easily on the front face. The weapon slides into place and sits on the drop down pocket, conveniently designed in the pack. Then there are straps found on either side of the front face. These form a unique fastening system that will secure the weapon to both sides of the pack. Secondly, on each side of the pack, you’ll notice quiver holders. Finally, there’s webbing on the waist belt that allows you to attach a holster in which you can carry your handgun. Being in the outdoors, the pack is bound to be exposed to the vagaries of nature. The harshness of the natural environment, the unpredictability of the weather, these are likely to give your pack a thorough beating. And if it isn’t well built, it might begin to buckle in the face of the punishment. To counter this, the Matrix hunting pack is made of Fabric that ALPS Outdoor Z call brushed Realtree Xtra HD. Simply put, this fabric that bears a scratch resistant nature. It can easily withstand the attacks that come from tree branches and bushes. To reinforce this hardwearing quality, there’s a blaze orange rain cover included. When you find yourself out in the rain, all you’ll need to do is pull out the rain cover and lay it over the backpack. It works efficiently, allowing water to slide off rather than seep in. Then, as we all know, we always need water when on our expeditions. And being able to get that water without lugging with us bulky bottles is an added advantage. That’s why the Matrix pack has been built with a hydration pocket and port. In this pocket, you can add a water reservoir that can carry enough water for your trip. Then, through the port, attach a hydration bladder and what you’ll have there is a system in which you can get a constant supply of water while you’re on the move. 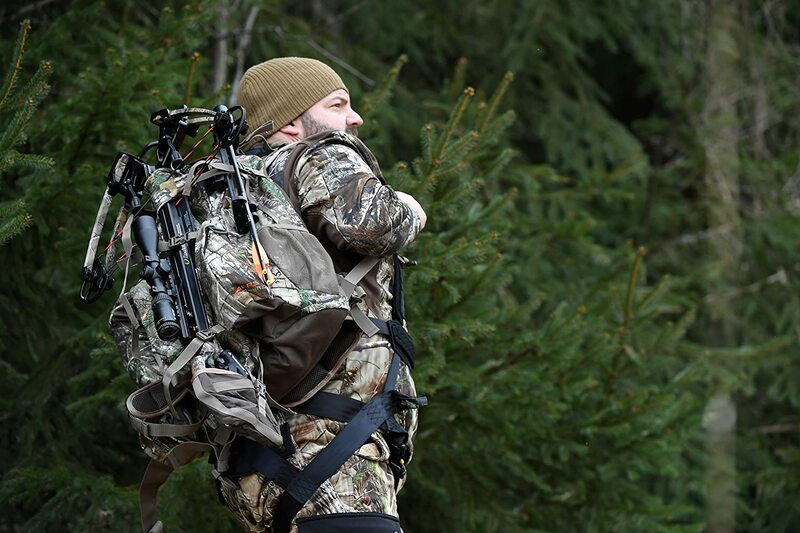 With a total carrying capacity of 2700 cubic inches and an assortment of pockets and compartments, the ALPS OutdoorZ Matrix Hunting Pack enables you to carry all that you’ll need. Having a center aluminum stay, you get extra support while carrying the massive load that this pack can bear. With the lashing straps, you’re able to attach extra gear onto the outside of the pack. The Matrix is made of a hardwearing fabric that allows the pack resist the harsh outdoor environment. Included with the pack is a blaze orange rain cover that keeps the pack protected in the event of a downpour. It’s designed to carry a crossbow, compound bow or rifle thanks to the fastening system on the front and the drop down the pocket. With a hydration pocket and port you can include a hydration pouch and attach a bladder. The pack doesn’t have a dedicated meat hauling system. Q: Does the ALPS OutdoorZ Matrix Hunting Pack have a frame built into it? A: No it doesn’t. However, it has a center aluminum stay which serves a similar purpose as a frame. Q: How much of a load does the pack support? A: It can support about 20 to 30 pounds of weight. Q: Is there a dedicated meat pocket? A: No, there isn’t a meat pocket. Q: Can the waist belt fit a waist size of 38”? A: Absolutely. It’s wide enough to fit an even larger waist size. Q: Do you get the handgun holster on purchase? A: No, the holster is sold separately. Daypacks have long been thought to lack the functionality of their larger counterparts. However, with the likes of the ALPS OutdoorZ Matrix Hunting Pack, this perception is beginning to change. Here we have a pack that is compact and lightweight but can hold a sizeable amount of gear. It does this while ensuring you remain comfortable, keeping the strain off your shoulders and back. What more could one ask for? 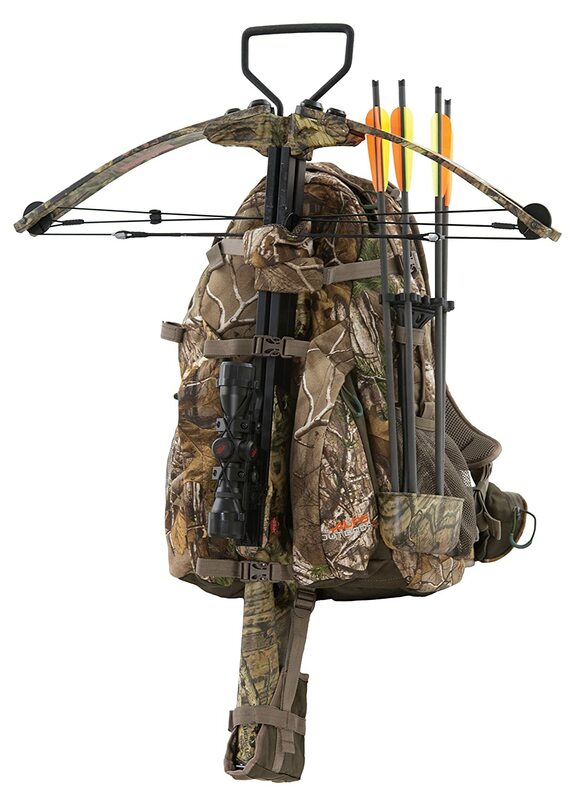 This is the perfect choice for a hunting daypack.